(PhysOrg.com) -- People from East Asia tend to have a tougher time than those from European countries telling the difference between a face that looks fearful versus surprised, disgusted versus angry, and now a new report published online on August 13th in Current Biology, a Cell Press publication, explains why. Rather than scanning evenly across a face as Westerners do, Easterners fixate their attention on the eyes. "We show that Easterners and Westerners look at different face features to read facial expressions," said Rachael E. Jack of The University of Glasgow. "Westerners look at the eyes and the mouth in equal measure, whereas Easterners favor the eyes and neglect the mouth. This means that Easterners have difficulty distinguishing facial expressions that look similar around the eye region." The discovery shows that human communication of emotion is a lot more complex than experts had believed, according to the researchers led by Roberto Caldara at The University of Glasgow. As a result, facial expressions that had been considered universally recognizable cannot be used to reliably convey emotion in cross-cultural situations. The researchers studied cultural differences in the recognition of facial expressions by recording the eye movements of 13 Western Caucasian and 13 East Asian people while they observed pictures of expressive faces and put them into categories: happy, sad, surprised, fearful, disgusted, angry, or neutral. The faces were standardized according to the so-called Facial Action Coding System (FACS) such that each expression displayed a specific combination of facial muscles typically associated with each feeling of emotion. They then compared how accurately participants read those facial expressions using their particular eye movement strategies. It turned out that Easterners focused much greater attention on the eyes and made significantly more errors than Westerners did. The cultural specificity in eye movements that they show is probably a reflection of cultural specificity in facial expressions, Jack said. Their data suggest that while Westerners use the whole face to convey emotion, Easterners use the eyes more and mouth less. A survey of Eastern versus Western emoticons certainly supports that idea. "Emoticons are used to convey different emotions in cyberspace as they are the iconic representation of facial expressions," Jack said. "Interestingly, there are clear cultural differences in the formations of these icons." Western emoticons primarily use the mouth to convey emotional states, e.g. 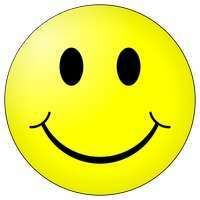 : ) for happy and : ( for sad, she noted, whereas Eastern emoticons use the eyes, e.g. ^.^ for happy and ;_; for sad. "In sum," the researchers wrote, "our data demonstrate genuine perceptual differences between Western Caucasian and East Asian observers and show that FACS-coded facial expressions are not universal signals of human emotion. From here on, examining how the different facets of cultural ideologies and concepts have diversified these basic social skills will elevate knowledge of human emotion processing from a reductionist to a more authentic representation. Otherwise, when it comes to communicating emotions across cultures, Easterners and Westerners will find themselves lost in translation." Wow, my understanding of anime just reached a whole new level. "Interestingly, there are clear cultural differences in the formations of these icons." Western emoticons primarily use the mouth to convey emotional states, e.g. : ) for happy and : ( for sad, she noted, whereas Eastern emoticons use the eyes, e.g. ^.^ for happy and ;_; for sad." Absolutely fascinating. Also, smiling has different uses in the East, so I wonder if that has to do with the mouth being less important to communication? Does this mean that Westerners who like things like anime have a hard time reading faces? Does this have anything to do with autistic's difficulty with reading faces? Forgot about kissing, too. Kissing is not nearly as important to Eastern cultures as it is to Western. Does the sexual nature of the kiss have an effect on where Westerners look on a face? This also suggests that Westerners describe Easterners as "inscrutable" because Easterners aren't providing the full range of mouth-based emotional cues that Westerners expect. I wonder if this might be not just cultural, but (partly) genetic. Are there corresponding differences in brain structure or firing or in innervation of the facial muscles? I wouldn't be too quick to assume that the Eastern way doesn't have its advantages. For instance, perhaps the eyes don't lie as easily in certain situations (it's easy to fake a smile, but harder to fake the wrinkles around the eyes). Or (to me), a larger benefit is that people are more likely to know you're happy when you're not making an effort to display it with a phony smile on top. some Asian cultures (especially females) tend to cover their mouths when they laugh so that you can't see it; Why is that, and is it somehow related to this phenomenon? Probably because it's "unladylike" to laugh in their culture. That is a great question. I know that we cover our mouths when we cough primarily out of sparing people the disgust experienced when coughed on. Maybe there is some cultural stigma against laughing, that it is correlated with disgust in some sense. Sometimes laughing conveys derision or shame, and thus may seem "unladylike"